The beer mile. A unique track event not for the faint of stomach. Drink a (340mL) beer, run a quarter mile, repeat three more times. Suffer a ‘reversal of fortune?’ Run an extra quarter mile or be disqualified. 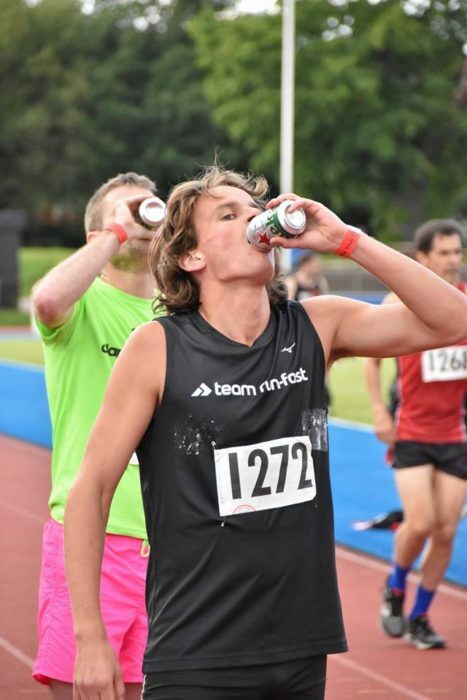 On Saturday, August 12th I competed in the Beer Mile World Classic at Allianz Park. 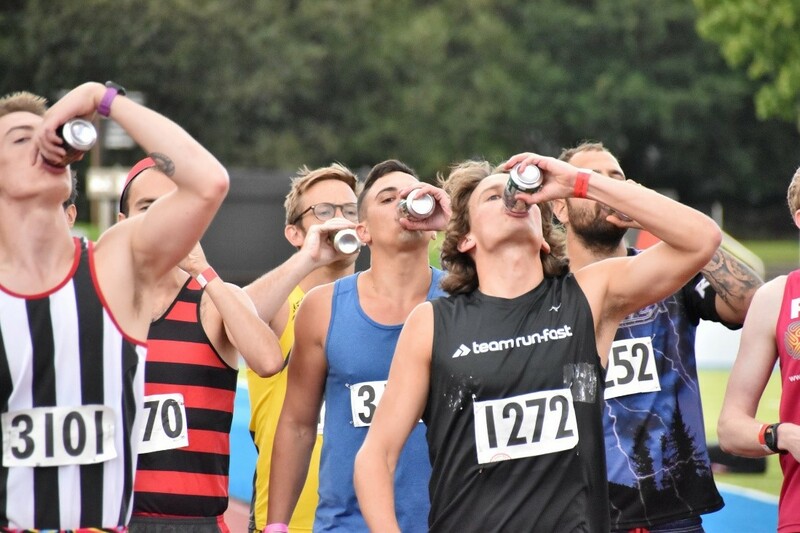 Begun in 2015 in San Francisco, London has now hosted the two most recent editions, assembling a world-class field to determine the world’s best countries and individuals in the beer mile. Having won a few beer miles previously, and already residing in London, I was hoping I might snag a spot on the US team for the international competition. Sadly, this was not to be, with a stacked American team already entered (hence why Team USA is known as the #HardestTeamToMake). Gassing a beer. Heineken was provided, though many elites brought their own beer. Minimum 5% ABV is required. All photos Mark McPartland, 2017. Out to run a time that would challenge the elites, I got after it in the ‘seeded’ section and ran to a huge 5:44.47 PB, winning my heat by well over a minute and finishing 9th overall when factoring in ‘elite’ performances on the night. I was awarded a large bottle of Belgian beer for winning my section, which I quite enjoyed. Sneaking by on the inside. I believe this was as I was finishing. Though I went there alone (my flatmate flaked out – thanks a lot Mo), I quickly made friends there and got roped in to doing the International Relay following the conclusion of the elite races. The elite races were a thrill to watch as well, with USA completing a 1-2-3 sweep. There was even a rowdy after party back near London Bridge to top the evening off. Given the 4+ beers and great atmosphere, this event was well worth the £25.33 entry. Allianz Park is up in NW4 and a little out of the way from a tube station but I was easily able to take an Uber with others upon leaving the event. 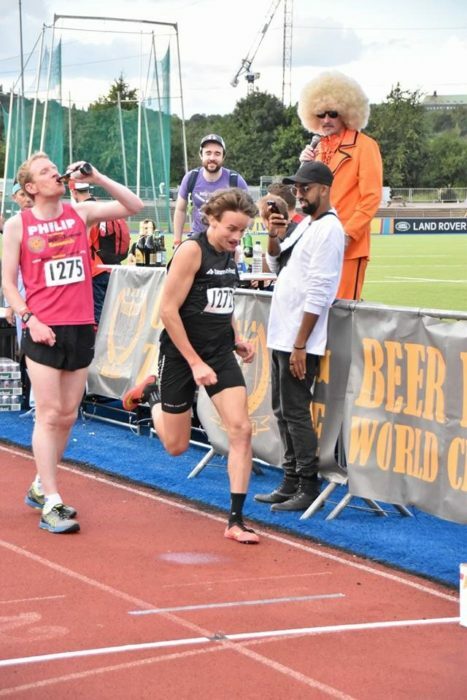 The beer mile is not an easy event to put on given the logistics, laws, and everything else so I have to tip my hat to the Beer Mile World Classic, especially for hosting it in an official track venue and using electronic timing. Dozens of locals participated in addition to the elites from the US, Canada, Scotland, Sweden, and beyond. Two separate bachelor parties (or ‘stag dos’) even made the trip out and the hosts ensured the soon-to-be-weds had a memorable night. I absolutely recommend this event to anyone looking to challenge themselves in a unique event while sharing in some great camaraderie on a night out not to be missed. I will certainly be back next year and plan to lower my PB even further beforehand to get onto Team USA! Previous Previous post: Are You Sitting Uncomfortably?